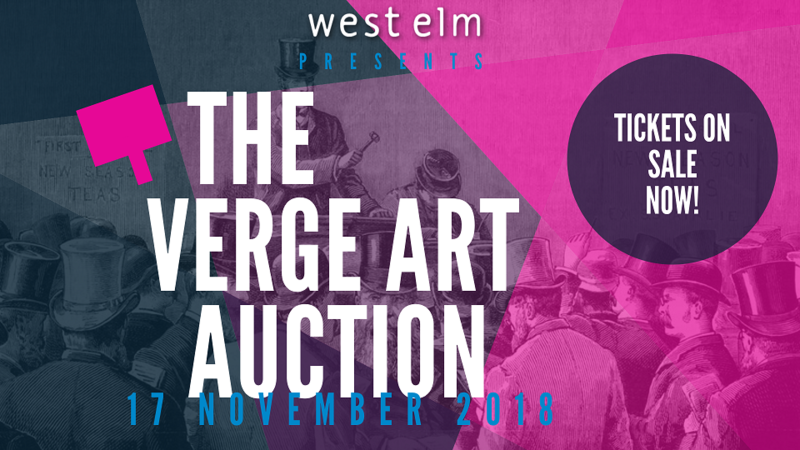 Saturday, November 17 at 6:00 p.m.
Join Verge Center for the Arts and presenting sponsor, west elm, for an unforgettable party celebrating Sacramento talent and California’s unique contemporary arts. With light installation & music by Alex Trujillo, food by Beast & Bounty, centerpieces by Public Land, additional bar brews courtesy of Lagunitas Brewing Company, and the first ever custom Verge cocktail, it’s definitely shaping up to be an great evening! Verge events are known for their unusual themes and unequaled experiences and are a part of a cultural movement in Sacramento that helps maintain local talent while attracting national attention. Buy your tickets today! Do your part to support local talent and then treat yourself to the added bonus of getting to party with Verge! The Verge Art Auction spotlights emerging and established artists and gives new collectors the opportunity to start their own collections, and savvy collectors the chance to grab pieces by renowned artists and to discover new talent. Don’t miss your chance to be part of the party that helps Verge continue in its mission to develop the future for contemporary art in the Sacramento Valley. We would love to see you there! Buy your tickets or become a sponsor today! All sponsors will get an exclusive invitation to the Sponsor Preview Reception on Nov. 8, and sponsors at the Benefactor level and above will access to the west elm VIP micro lounges on the evening of the auction.